…a colorful, unique, fantastical, magical, Fun-to-read memoir! Unfortunately FIERCE LOVE doesn’t translate to Kindle or Nook; it appears the technology for conversion is lacking. If you are interested in purchasing the PDF version please enter your email address below and AlphaMom will be in touch! A pictographic memoir too big for one (self-published) soft cover! It is a fact that paper books are more expensive than digital ones. If you like reading the old-fashioned way it simply costs more. Please know that AlphaMom had absolutely no paw (not even one woof!) in the pricing of Fierce Love. Please help spread the printed worrrrd! 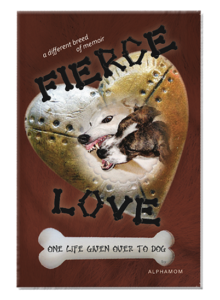 Do you want your Book Club to read Fierce Love? So does AlphaMom! Contact her for special Book Club pricing.